Gus Durbin was an entrepreneur and saloon owner in Brooklyn. I like him because of the witty name he gave his saloon, The Carrie Nation (Google the name and you�ll understand☺). For his saloon, Gus Durbin purchased a very sophisticated disc music box. The museum now owns Mr. Durbin�s music box. The Brooklyn saloons were the social hub for many men. It was at the saloon where they heard local and regional news, found work, and I�d like to think, where many men received a little bit of culture by listening to the music box. 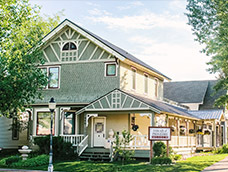 The museum�s music box includes ten discs that play the songs �Coming Through the Rye,� �She May Have Seen Better Days,� �Treasure Waltz,� and more. Disc playing music boxes were introduced in Germany in 1885. By 1892 the Regina Music Company opened in New Jersey and quickly become America�s finest and largest music box maker, selling approximately 100,000 units from about 1892 through the mid �teens. Regina�s sales grossed about $2 million a year. The cost of a Regina music box was between $12 and $300. 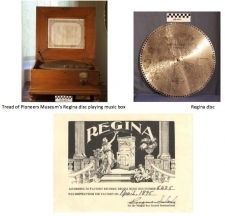 According to Regina factory records, the museum�s music box was shipped from the factory in April of 1895. We do not know if Gus Durbin ordered the music box from the Rahway, NJ factory or if he acquired it later. 1914 also marked the end of the Brooklyn saloons. Changes to state liquor laws and efforts by concerned citizens of Steamboat Springs to clean up the area, forced the closure of the saloons, boarding houses, and brothels in Brooklyn. Who owned the museum�s music box between 1914 and the 1950s isn�t clear. When the museum opened in 1959, the music box was donated by Mrs. McClure Johnson, a local author and artist. Today the music box is being carefully preserved in the Tread of Pioneers Museum�s collection facility. The same day I sent this blog to the Director for release, I met a family member of Helena Johnson, the donor of our music box. The coincidence was astonishing to me. Up until my research for this blog, days earlier, I had no knowledge of this remarkable woman. Helena Johnson lived part time in Steamboat Springs and as an author and lover of the outdoors, she helped start the first Boys Camp in Steamboat Springs (which eventually became Lowell Whiteman, now called Steamboat Mountain School). I hope to have further conversations with the family and hopefully learn more details about the music box and its donor.